Just the alternate occupations of a couple of our recent life models. Sadly the Mountaineer (also known as the Naked Man) wont be modelling for us any longer as he has plans for Scotlands peaks. I always thought yoga was a good background for life models but mountain climbers also have the right stuff. 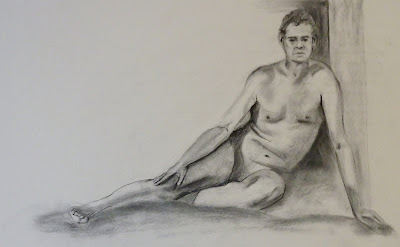 So this was a fairly long pose, nearly 90 minutes, charcoal on paper. 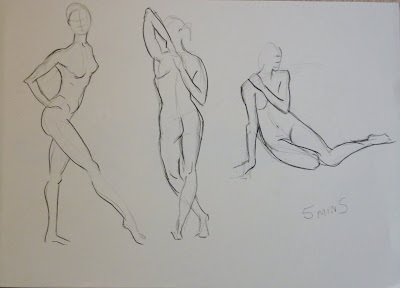 I was concentrating on the subtleties of the shadows as we had a nice lighting arrangment. Just a couple of things from the last workshop in Swindon. It was a vile day weather wise and I nearly concussed myself on my boot lid getting my things out when I arrived and aslo managed to throw hot coffee down myself. We had the elegant and athletic Jade modeling for us and started with the usual five minute warm ups. Unfortunately despite her excellent health and athleticism our part time circus performer suffered an excrutiating muscle spasm before this pose in oils was complete. She was OK in the end but was unable to do any more modelling. The organiser Rosemary stepped in and saved the day but nothing could save my day so I will spare you my efforts from the afternoon. Thats it for life now till the new year, where on earth did this year go? hello and Happy New Year to you - do I know you?